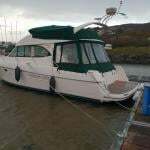 When Conor Fogerty’s beamy new Jeanneau Sunfast 3600 Bam first appeared on Howth Marina, most observers wanted to like her. After the grey years of the recession, BAM was like a breath of fresh air, a wonderful free-wheeling yet mainstream take on the all-conquering JPK range, with the same twin rudder configuration. 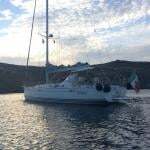 Yet by being from Jeanneau, she had an air of accessibility, whereas you’ve to queue for a JPK. Nevertheless it was clear that the short-leg courses of the racing in the greater Dublin region were scarcely going to allow her to spread her wings, and even in longer ISORA events, much of the time you’re unlikely to get a pronged period of the kind of conditions that allow BAM to fly, and sail up to and beyond her rating. BAM in Dublin Bay. She looked great, but gave every indication of needing wide open spaces, plenty of breeze, and preferably a bit of sunshine to give of her best. But with a mighty leap, our hero freed himself. BAM and her skipper and some mates took off in the Autumn, and scampered across the Atlantic in the ARC to line themselves up for the RORC Caribbean 600 at Antigua on Monday February 22nd. In the race, BAM was never out of the frame, and other Irish-crewed boats doing well too. But while most of the other Irish personnel had crossed the Atlantic in comfortable big jetliner style, there was the little BAM racing her heart out after sailing every inch of the way from Howth just to get there. It was inspirational stuff, brought to a perfect conclusion with the IRC 3 overall win. The story will go on, and BAM’s skipper has further projects to implement during his Atlantic circuit venture. But for now, Conor Fogerty is a very worthy “Sailor of the Month (Racing)” for February 2016. Wishing him well – Howth YC Commodore Brian Turvey with Conor Fogerty at a party in the clubhouse to send BAM on her way across the Atlantic last year. Brian Turvey later caught up with BAM and her crew in Antigua in late February, having jetted out to join the Howth crew on the First 40 Southern Child which finished third in IRC 2 in the RORC Caribbean 600 2016.